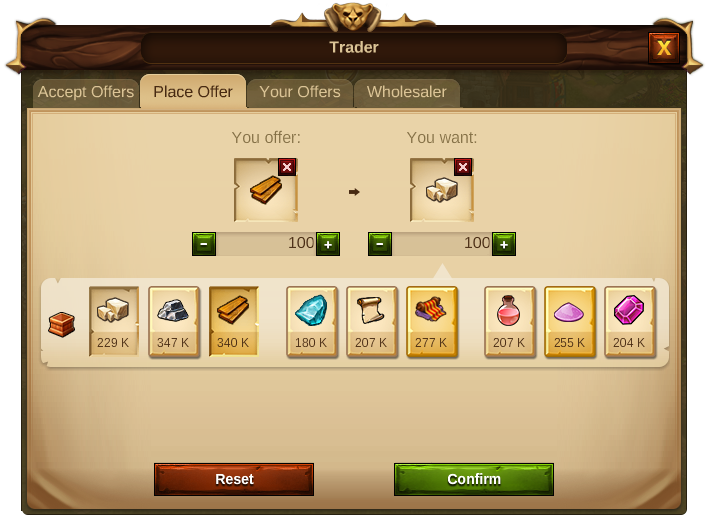 In the Trader you can exchange your Goods with other players. The main goal here will be to exchange the overproduced Goods, which are produced in your boosted Manufactories, for Goods you may need. In order to build the Trader, you will need to unlock it's technology in the Research Tree and have the required resources. It will also need a street connection to the Main Hall. It cannot be sold nor rebuilt. 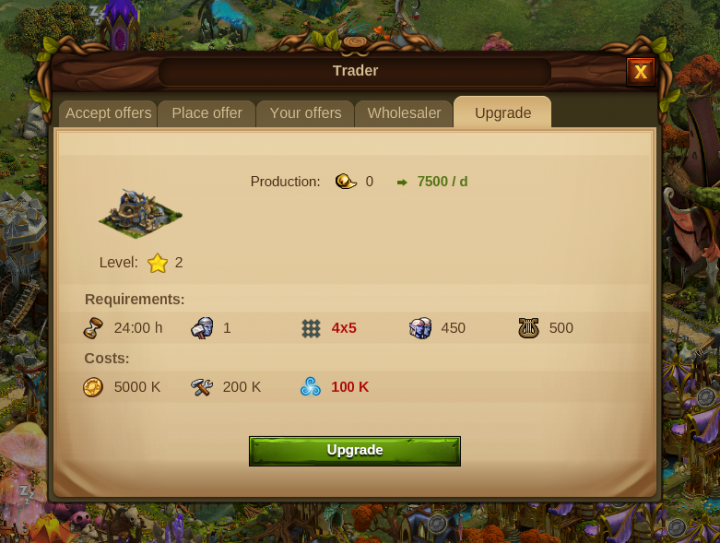 The Trader can be upgraded once you research the Halflings. Clicking on the Trader you will see 4 tabs. The first one is "Accept Offers". Here you can see all offers from other players that are within your offer range. On the top you will find two drop down menus, which allow you to filter the offered and/or the demanded Goods. 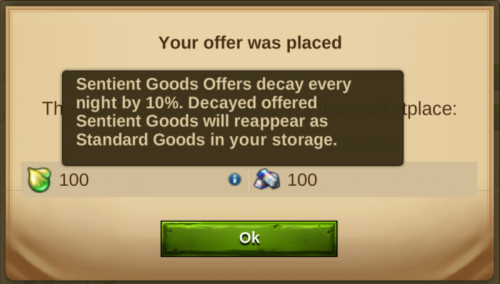 You can accept offers if you have the demanded amount of Goods at your disposal. Acceptable offers are listed first. 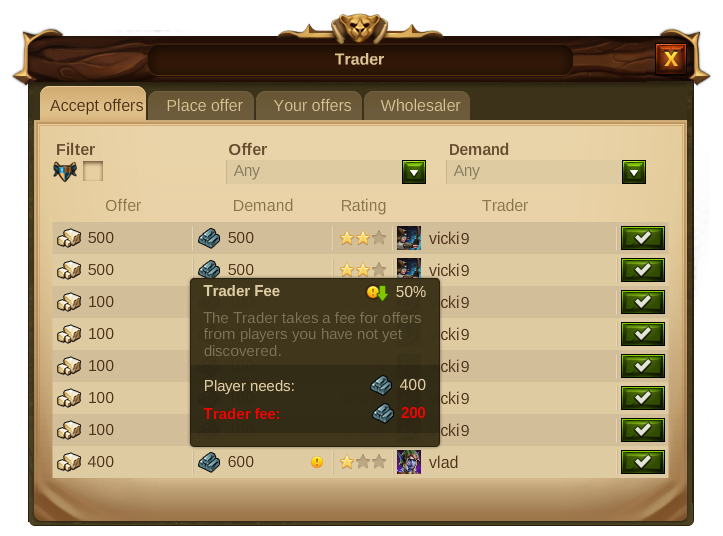 Trader Fee: Some offers are marked with a fee icon . 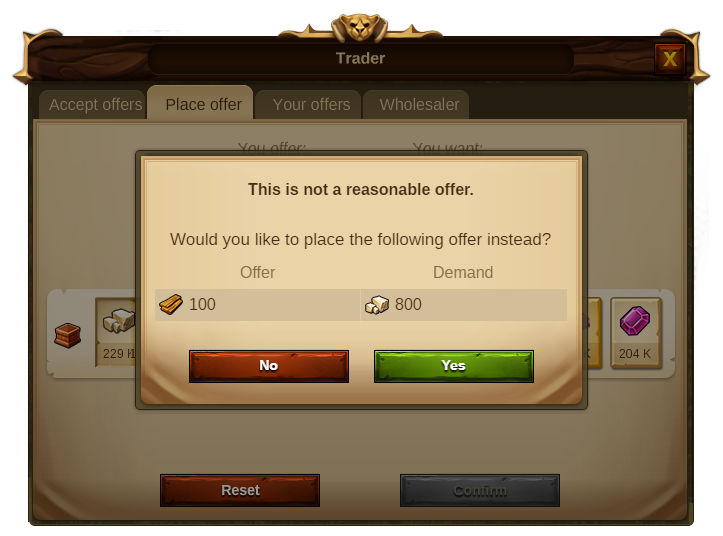 The Trader will take a 50 % additional fee for those offers when they are from players you have not discovered yet. You can discover a player by scouting a province next to his city. Offers from discovered players or Fellowship members have no fee. Hint: Ancient Wonders can reduce your Trader's Fee! Please notice: The Trader withholds the fee, so it won’t be received by the user who offered the trade. 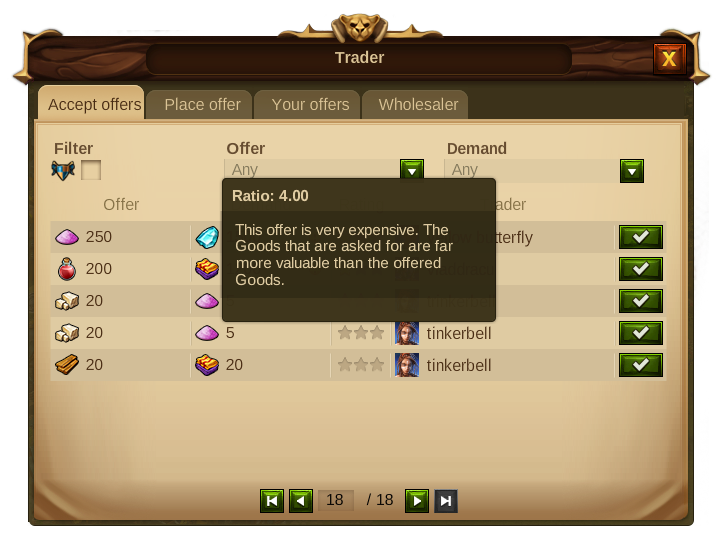 Rating: The Trader rates an offer from 0 to 3 stars, 0 being very expensive, 3 being a bargain. How is an offer rated? Goods are grouped into three qualities: Basic Goods, Crafted Goods and Magical Goods. The ratio between those categories is 1:4. For example: 1 Crafted Good is worth 4 Basic Goods. The rating compares offer and demand to determine whether an offer is “very expensive” (0 stars), “somewhat expensive” (1 star), “fair” (2 stars, offer and demand have the same value) or “a bargain” (3 stars). Here you can place an offer. To make an offer, click the Goods icon you want to offer, then the Goods you want back. Add the amount you want to exchange and the system will automatically fill the field with the “fair” corresponding amount (so the offer will be shown with a 2-star-rating when viewed by others). You can type in a different amount you want back but be aware that the system won’t allow you to make an unreasonable offer. If the system detects an unreasonable offer it will auto-correct the amounts to an acceptable range. For example: You want to offer 100 Planks and want 500 Marble, The Trader will suggest to you, as an alternative, to ask for 400 Marble instead of 500. This offer will still be rated very badly of course, but it will fall within the acceptable range for trades. Hint: You can only have a maximum of 60 offers in the market at the same time. In this tab you will see the offers you have placed in the market but which have not yet been accepted. 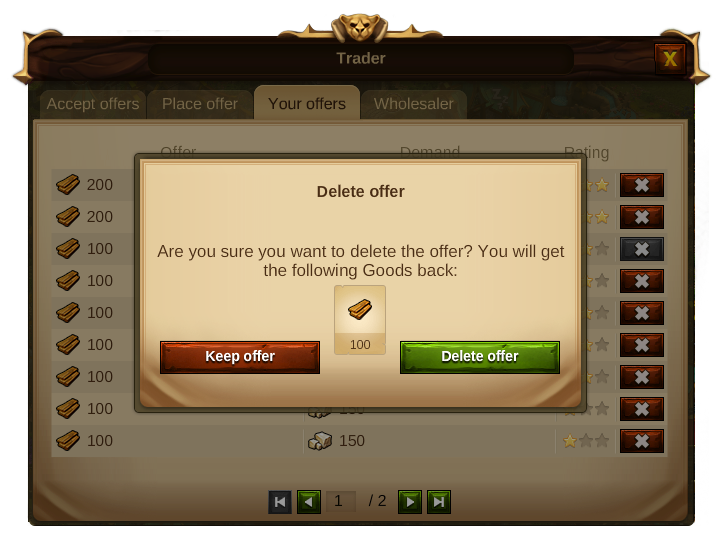 When you place an offer in the market, the goods are removed from your storage in your Main Hall, however you can,at any time, delete your offers and receive the offered Goods back. This is the tab where you will find some Trader default offers. The offers listed here are not profitable but of course you might want to use the wholesaler, if you do not find any trading partner available or if you want to get rid of a certain overproduction of resources. You will only be able to purchase Goods that are not listed as your Boosted Good (under the Main Hall - relics tab). You can purchase these Goods using your Boosted Goods, Coins, or Supplies in exchange for Goods of the same tier. The amount of Goods you will get in exchange for your Boosted Goods will be 1: 5. For example, you will get 100 Steel in exchange for 500 Marble. Value-wise, you will pay even more Coins and Supplies for the same quantity of Steel. Every time you accept a specific offer, the wholesaler will increase the cost of the offer you previously bought. The wholesaler will reset the prices daily. Every time you unlock a “Production Boost” in the Research Tree, your wholesaler will add the respective offers to his catalogue. The amount of goods you have to pay and the goods you get back depend on your Main Hall level. 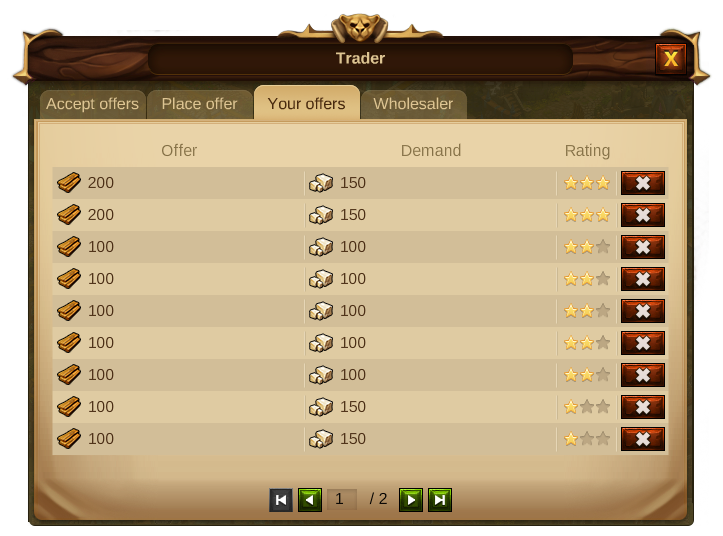 However, when you use the Blooming traders guild you can get a more favorable offer. 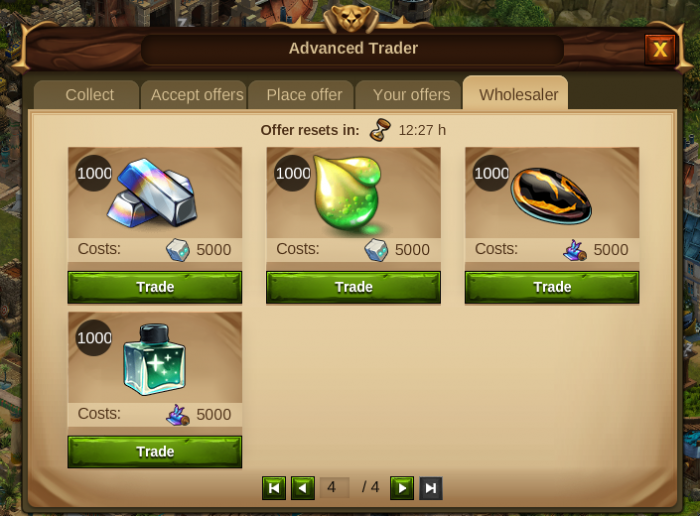 When you build the Trader and open the wholesaler, you can exchange your Coins, Supplies, or Boosted Good for the Goods of the same tier that are listed. Ex: If Marble is your Boosted Good, you will be able to use Marble to purchase Planks and/or Steel. When you reach Chapter XI Halflings, one of the first technologies you will unlock is the upgrade to the Trader. This adds an 'Upgrade' tab which allows you to upgrade the Trader to level 2. 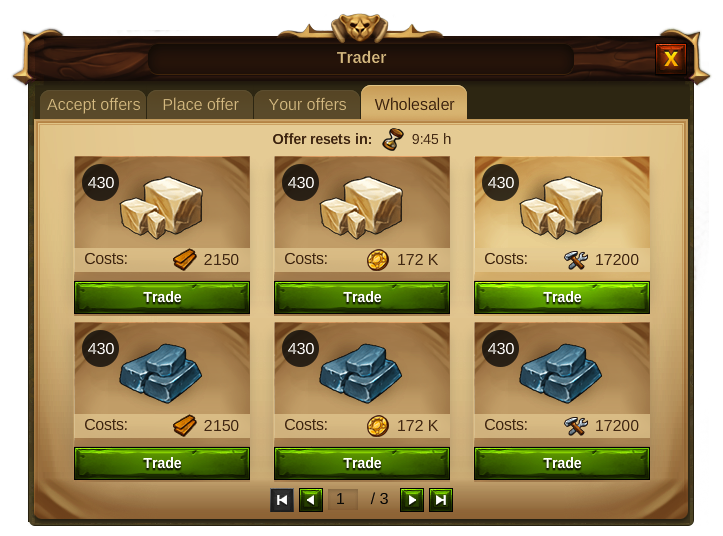 Upgrading the Trader will not affect its current functionality but will add a new tab with the title 'Collect'. 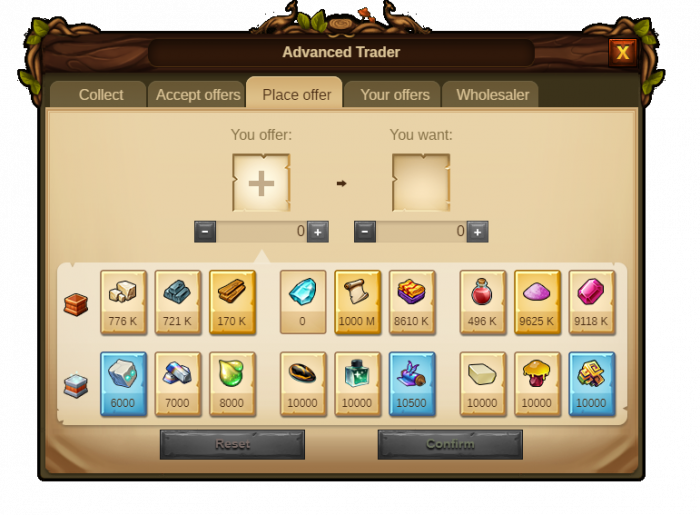 In the 'Collect' tab, the Trader will auto-produce a new permanent resource, Divine Seeds. The resource works like Mana, including production and early collect, display in the HUD, decay etc. In addition, there is a Collection Bonus. 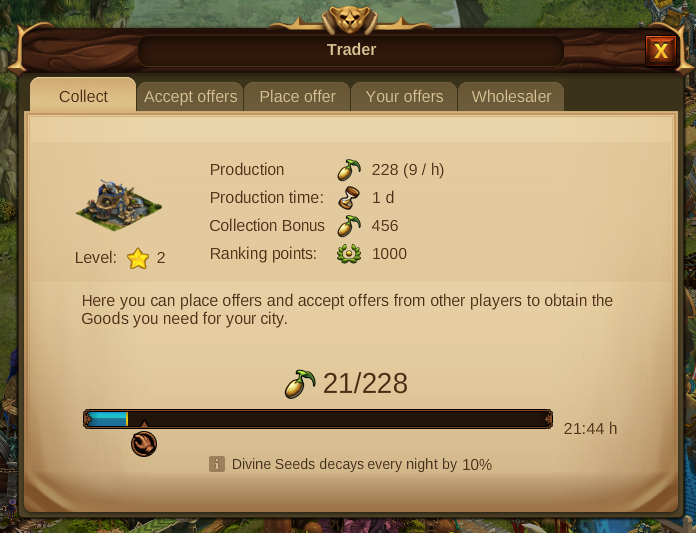 Every time the player collects Divine Seeds from the Trader, he will get an additional amount of Seeds, according to his combined AW levels. - The Trader generates Divine Seeds every 24 hours. This is based on one Seed per Main Hall level multiplied by the number of Provinces completed. - Collection Bonus. Every early collection receives an extra amount based on one Seed per Main Hall level multiplied by all your AW levels combined. Divine Seeds are construction costs for Culture Buildings and unlock costs for technologies, both starting from this chapter. Please follow the link Guest Races: Halflings for more information. Please follow the link Guest Races: Elementals for more information.